well the rain came and really gave it a good drenching you could almost hear the grass going awwwwwww!!! thats better and the plants have perked up no end ..perhaps i should have sat in the rain too it might have done me the power of good.....well im wittering as per usual i made this a few days ago..for nothing special just had a play i found the fabulous blogger i thought did amazing stuff .http://mariannespapir.blogspot.co.uk/.so im her follwer and i thought id give this envelope card ago...again a free hand drawn shape...used Tim Holtz Papers...the heart slids out with room on the back for message etc..kept it low on embellies....so hope you might like it..right gotta go...decided i need a cake now!!!! TTFN loves you all and thanks big time for the wonderfull messages of support etc...sassys hugs to you all..
Oh Sassy, I wish I could come have coffee with you. We could chat the day away. Another beautiful creaton. It is stunning! I love the gorgeous embellishments. I hope you have a good day, sweetie! 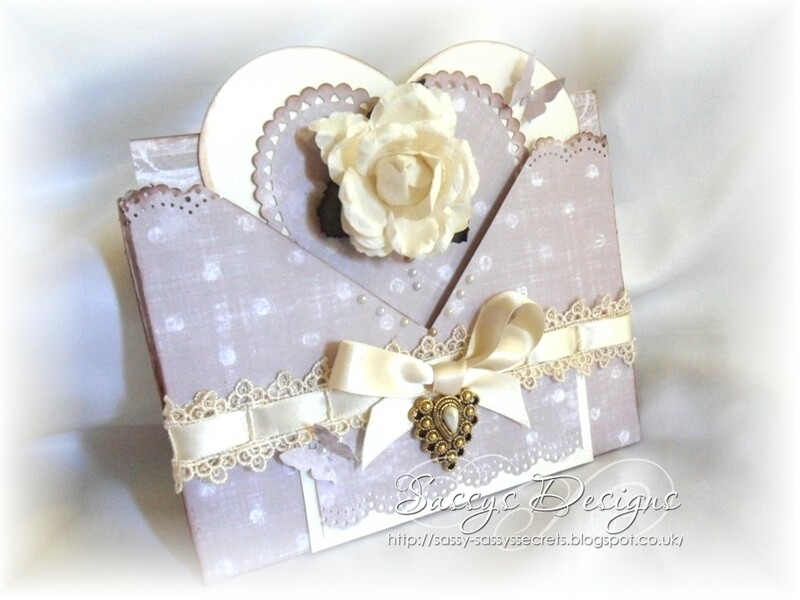 1 sugar please and I am with May a biscuit would go down nice with it around now lol, this is beautiful Sassy, I like the design the lace and that heart pendent. Pouring with rain here today. I'll pass on the coffee as I only drink decafe tea - think I'll go and make a cup to have with choccie eclair hubby bought me! Love the envelope card - very unusual. 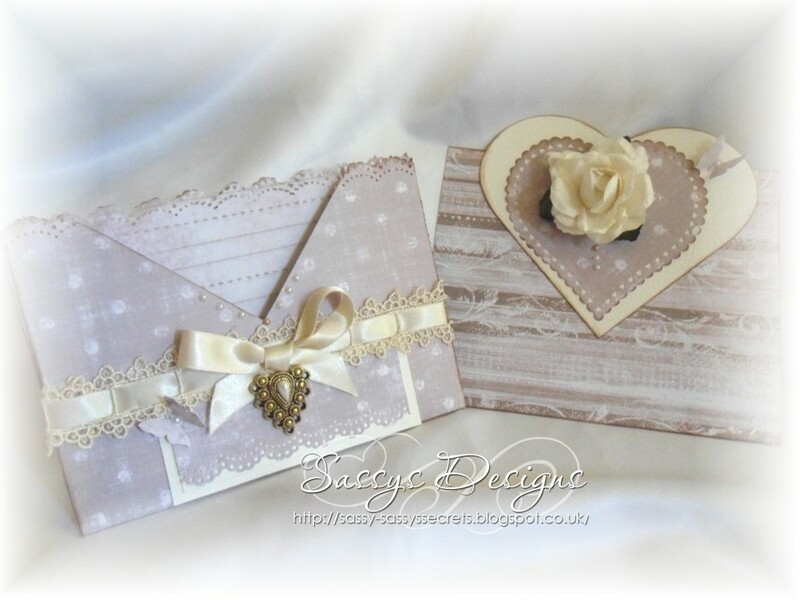 Even a bit simpler, your cards are just absolutely beautiful - stunning!! wowzer this is so amazing, love it!!! Hope you feel ok, Sweetie! If not, just take the hoover and you will feel all my warmth coming across the miles and hug you LOL! PS: Besides, coffe is sooooooooo yuk!!! Gorgeous envelope card Sassy - so elegant and stylish! My fave coffee is the Dolce latte mmmmmmmm! Only allow myself one a day though.